The US Embassy in Malta has reached out to me to clarify some issues regarding the extent of their involvement in the (fake) AUM case. The reply I have received is quite generic, but it does provide some more interesting insights into this case. 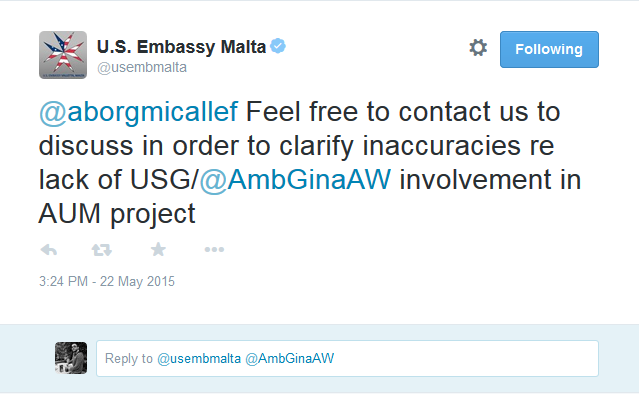 The US Embassy to Malta tweeted directly to my account and asked me to send them any queries which I may have regarding the presence of the US Ambassador at the ‘grand unveiling’ of the (fake) American University of Malta in the beginning of May. Can the Ambassador state the relevance of her presence at the signing of this private agreement between the Jordanian Investor and the Government of Malta? The Prime Minister’s Office extended an invitation to the Ambassador. The Ambassador attended to demonstrate the U.S. Government’s support for American-style education overseas. The U.S. Embassy was not consulted or involved in planning this project. Is the Ambassador aware that AUM will have nothing American about it, apart from the deal signed between Sadeen and DePaul which was agreed upon without an international call of expression? The U.S. Embassy does not have information on the number and kind of elements of an American-style education AUM will offer other than the DePaul University curriculum. There are a number of American universities in the world. They are called American because they seek to duplicate the American style of education, a style we believe has particular advantages. An American-style curriculum imparts general knowledge but allows for significant specialization. It provides a program of extra-curricular activities designed to cultivate the student’s humanistic outlook and social skills, and develops strong skills in critical reasoning and precise, persuasive self-expression. An American university offers exceptional liberal arts and professional education in a cross-cultural environment. Academic freedom and shared governance are some of the issues that American faculty members value. Accreditation by an American accreditation body ensures the quality of the higher education experience. In relation to the Ambassador’s comment “I Support Education”, what is her opinion regarding the changing of educational requirements to accommodate AUM? 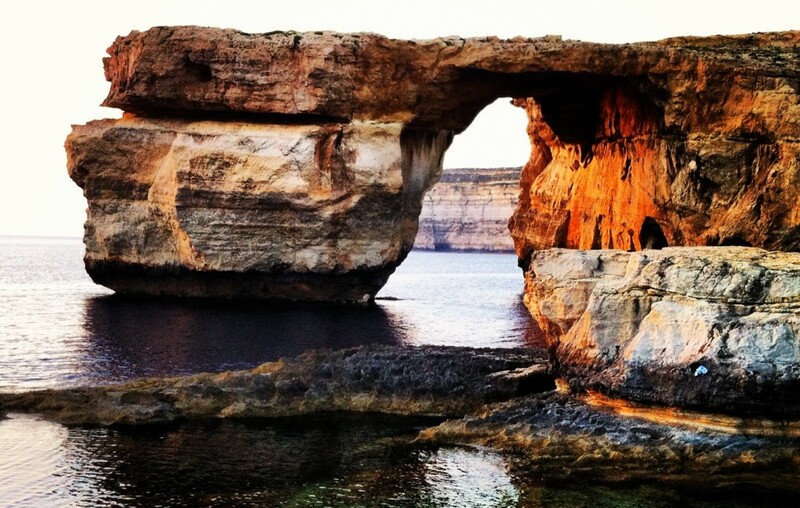 The Maltese education system is a local issue and falls solely within the Maltese government’s remit. There it is then; the Prime Minister invited the US Ambassador to Malta as a special guest for the announcement of the (fake) AUM. It becomes apparent that he involved the US Ambassador to support his claim on the relevance of this ‘university’, even though he is fully aware at how American this institution is going to be. He managed to rope in the senior representative of the US Government in this corrupt and abusive scandal. I find the following comment particularly pertinent – “Academic freedom and shared governance are some of the issues that American faculty members value”. Given how academics in Malta are livid at the lack of transparency with which the government changed the requirements for recognition of universities in Malta, AUM is seemingly become less American by the second. I hope this serves as a lesson to the incumbent and following US representatives to be careful in allowing themselves to become embroiled in the corrupt and undemocratic manner in which the current Maltese government chooses to operate.